Gentlemen, avert your eyes or suffer a terrible fate! I’ve decided that, despite my best efforts, I’m still not 'fatale' enough and so am making a conscious effort to add a bit more ‘belle’ and ‘sans merci’ to my allure. Hang on, I’ll have a bit of a break so I can talk to you properly without any imminent threat of being dragged off to my elfin grot, which to be honest, sounds a tad unsanitary anyway. There, that’s better, you’re quite safe, I’m back to being ‘avec merci’ or whatever it would be. 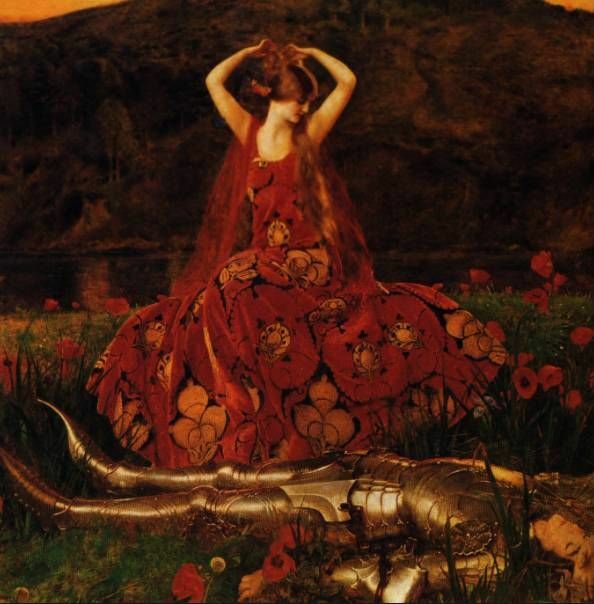 ‘La Belle Dame Sans Merci’ is a marvellous poem, simple and subversive in subject. 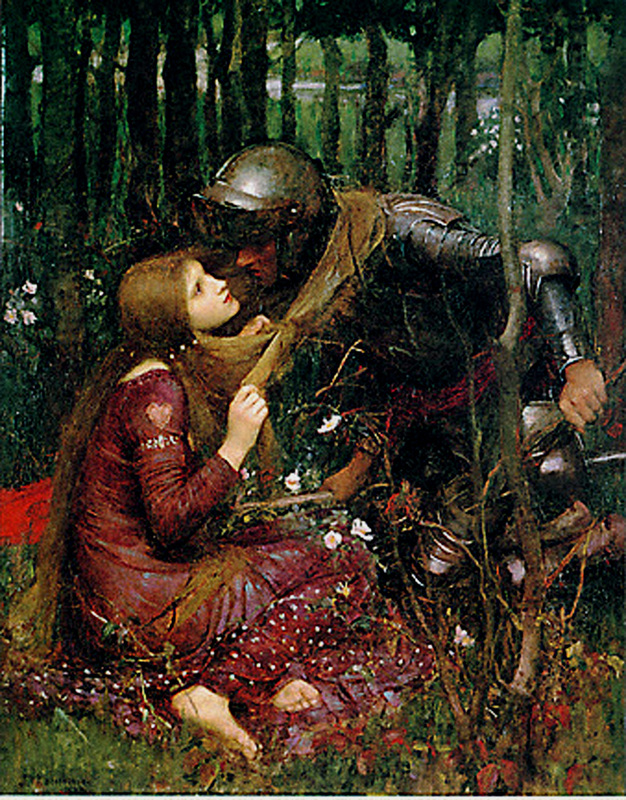 A brave knight sees a beautiful young woman in a meadow and stops. From that moment on, he is lost because she is a witch, a fairy and captures his soul, leading him off to her home in the hillside where she kept all her lovely young men prisoner as they slowly fade away. When the knight awakens out of his daze, he sits on the lonely hillside ruined by the experience, but unable to leave. Marvellous. Anyway, on to the imagery. 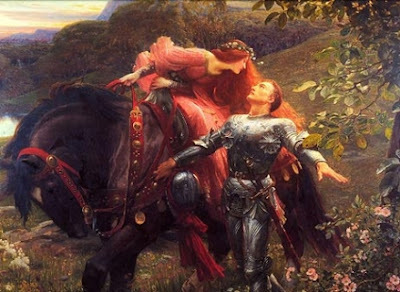 I was surprised by how few paintings of 'La Belle Dame Sans Merci' existed, I mean in comparison to other popular images of the Victorian era. There are some corkers though, and some are among the best known paintings of the era. Let’s start with Arthur Hughes. He shows the beautiful faery child leaning and singing to the smitten knight, and he is a goner. The girl bends almost impossibly, almost spineless, maybe a little serpentine and the knight is frozen in his devotion. I love that the horse seems to be either bowed at her power or hiding from her. Jarring the image of a pretty girl and her knight are the ghostly forms behind her, writhing and flailing in the air, prefiguring his fate when he too will be a wraith. It is an interesting combination of the picturesque and the grotesque which is at the heart of 'La Belle Dame...', which Hughes shows with skill. Possibly the best known depiction of the subject has to be Dicksee’s offering. Like Hughes, he shows the moment when bending, the beautiful woman sings her way into the knight’s soul. He is well and truly defenceless against her mystic powers and seems to feel a physical shock from her possession. I love his outstretched hands as if he is literally falling as well as metaphorically. 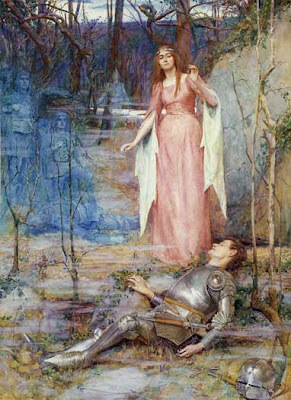 Rheam’s illustration shows the knight being lulled to sleep, and his dream of the terrifying spirit world where he will be trapped with the other victims of the faery’s power. Kings and knights all dwell there as pale shadows and a smoky mist swirls around the recumbent knight, as if his soul is drawing out of him in a cloud under the almost disinterested eye of the damsel. The latest in date of our bevy is Cowper’s maiden striking a rather ‘flamenco’ pose, surrounded by soporific poppies. She is the most actively mad of the girls, winding her hair with flowers as her knight lies unconscious at her feet. I adore her dress – when I become sans merci, I intend to do it in a frock like that. I am somewhat obsessed by the knight’s pointy feet. They are very pointy, and a little bit curved, or that might be where the light is hitting them. Nice shiny armour. If I am going to beguile gentlemen, it’ll be nice to get a shiny one. Here we have my favourite. Where other paintings have horses and large-scale glories, Waterhouse focuses attention on the kneeling girl and her knight, bending to be caught in her hair. He trusts the symbolism that she wears her heart on her sleeve, nothing to hide, but he has missed that she has slipped the hair-noose around his neck and he is lost. Even when he wakes he will be unable to leave, even though time has passed. He has lost his sense and reason and will to do anything but stay and remember the beautiful girl who stole his will from him. So my course is clear if I am to go out and break the spirits of gentlemen in a merciless manner. I have to grow my hair a bit more and get a fabulous frock. I’m sure that is all I am missing, after that I will go and find a mead to haunt, awaiting a knight. In the meantime I shall be reading the Pre-Raphaelite Sisterhood website book of the month, Mortal Love by Elizabeth Hand, taking note of Larkin who would make a splendid Belle Dame, had she not got other things to do…. I'm with you, I think the Waterhouse is my favorite. Although I really do love them all. Of course, Grace will love this post. She has a passion for La Belle Dame Sans Merci. I love Keats as well! My personal favourite among the narrative poems is Eve of St Agnes but the tension between the fairy and the knight in La Belle Dame Sans Merci is I thnk unbeatable. Hello Caroline, and thanks for your comment! 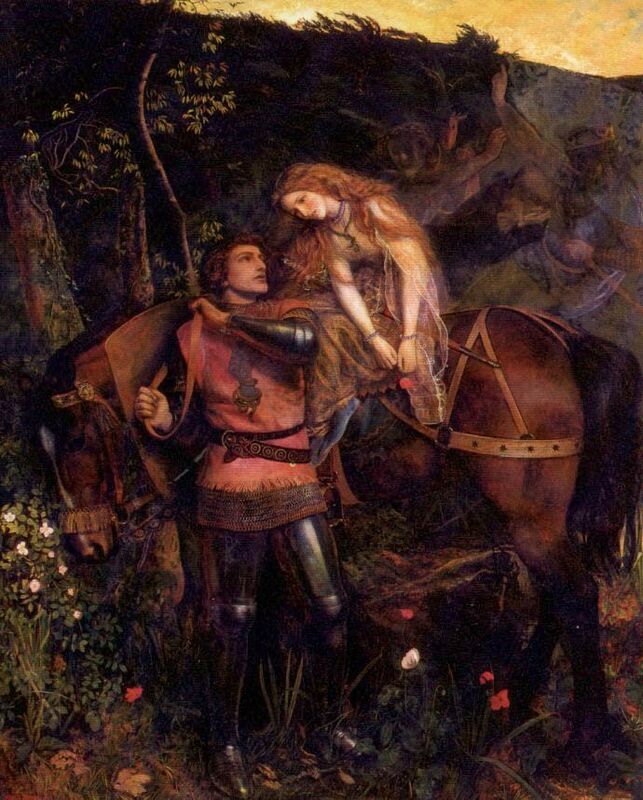 There is something special about the knight, personifying human strength, being powerless against the fairy.